Spotted Drum (Equetus punctatus) | Better Know a Fish! 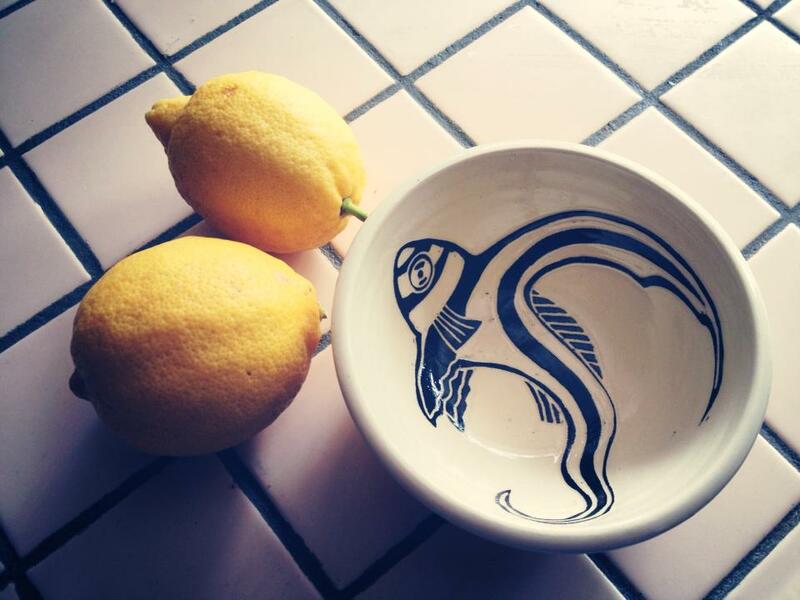 One of my favorite items in my collection of fish geekery are several bowls from potter Liz Russell of R Honey Pots in Forestville, California, whose ceramic creations are inspired by the sights seen on her diving vacations. Among the set is this one, featuring a juvenile spotted drum (Equetus punctatus). Spotted drum wiggle around with their flowing, ribbon like fins as juveniles; the ones pictured above are probably about 3 inches (7.6 cm), about the same as your little finger. The spotted drum is found in the western Atlantic ocean in shallow seas, along with many other members of the drum and croaker family, Sciaenidae. Larger species of drums and croakers are popular food and game fish. In North America, these include the redfish or red drum (Sciaenops ocellatus) popular in U.S. southern cooking and sportfishing, and the white seabass or corvina blanca (Atractoscion nobilis), a popular gamefish in Pacific waters. Another example would be the yellow croaker (Larimichthys polyactis) of the western Pacific, commonly mentioned in Chinese and Korean cooking. Drums and croakers get their name for their ability to make a drumming or croaking sound. We’ll talk more about this unique feature in another post. This entry was posted in Actinopterygii, Marine Fish, Perciformes and tagged aquarium fish, Atlantic Ocean, croakers, drums, Equetus, Equetus punctatus, Perciformes, Sciaenidae, spotted drum. Bookmark the permalink. Pingback: White Seabass (Atractoscion nobilis) | Better Know a Fish!